Love Cycling Awards: Very successful, raises the bar for future events! Great atmosphere, TV3 coverage. Diversity of people attracted. A credit to the hard work and efficiency of Jill Ford. Thorndon Quay. There have been around 400 submissions on the interim solution between Davis St and Mulgrave St. Oral submissions include informal consultations with councillors on 5 April, and formal submissions to the council as a whole on 12 April. The interim proposal sets a precedent for replacing angle parking by safer parallel parking; but the painted bike lanes don’t meet NZTA guidelines. Currently there is poor enforcement of the clearway. Newtown connections are “next off the rank”. Bike Newtown will be revitalised to give feedback. There is a suggested route from Wilson St/Owen St around the back of the Hospital that could provide an interim solution for people coming from Kilbirnie to the CBD, but currently involves some steep steps. Ngauranga interchange: WCC is widening the cycle path under motorway and around to stock entrance/bus stop. AGM – in June, ideas for speaker/event welcomed. Your chance to volunteer for the committee! We feel a need for a “Voice” for CAW – someone representing people we campaign for younger, female, Interested but Concerned. Some names suggested. Membership. High visibility events such as the Love Cycling Awards attract people to our web site and FaceBook Group (Instagram is suggested to communicate with younger people). But our challenge is to get people to join as financial members. If you’re not a member, sign up now – it’ll be the best $50 you spent on cycling! Biketober – Krissie and WCC are working together, hope to include an open streets event from PO square to Pukeahu. Ellie suggests making Molesworth St contraflow. Mark gave big ups for John Randal’s running a very successful Good Friday Criterium. Ellie saw good news in the new Government Policy Statement on transport favouring cycling, and IPENZ Christchurch backing cycleways. Ride for HELP are doing a presentation on their Tour Aotearoa ride, 1730 11 April Sustainability Trust. Jo talked about some CAN activities: Annual CAN Do 29 July Palmerston North preceding the 2WALKandCYCLE conference (these events are a great chance to catch up with fellow advocates), and the Vision Zero campaign (fill in the survey if you haven’t already). Biketober. Krissie talked about a proposal for a spring month of bike activities, Biketober. This was very successful in Christchurch and Auckland last year. Krissie will talk to WCC about their spring bike promotion plans. CAW broadly supportive, can act as sponsor for grants etc. Membership. We discussed how we could increase involvement, through both financial membership (which helps support CAN) and social media. Thorndon Quay. Concern about the abandonment of the consultation process, and that the current proposal is very much an interim measure. Members are encouraged to submit, and to make an oral submission. Ron will coordinate. Oriental Bay. Pity that only a restricted area is being considered. Evans Bay Parade, Kilbirnie. Good proposal, though bus stop could be better handled. Love Cycling Awards. Nominations close 13 March, Jill welcomes more nominations, volunteers for event on 27 March. Ngauranga Gorge. We discussed the issues with cycling this route to/from the northern suburbs. Ben has had close calls with vehicles turning across his path into Glover St, and has met with WCC staff. However there aren’t easy answers. Cycling facilities in Europe (and Bogota). Jill shared her observations from her time away. She managed to participate in the Bogota Ciclovia, which has been the model for similar events around the world. In England she was based in Bristol, the home of SusTrans, which has created a nationwide cycle network. She also managed to tour Europe from Finland to Slovenia. Here is Jill’s presentation. Thorndon Quay: a compromised solution, compromising safety? Be there to be part of the movement. Tuesday 6 March, 6-7:30pm, Sustainability Trust, Forrester Lane. Last year the Wellington City Council initiated a project and established a community stakeholder working group to find options for creating safe cycling along Thorndon Quay as part of the Urban Cycling Programme. The various people on the working group represented local businesses, residents, walkers and cyclists. Together they came up with a vision that would change Thorndon Quay from the current day ugly industrial looking commuter route to a boulevard-style destination. A number of objectives were agreed to enable that vision including avoiding impacting on the local businesses, but also ensuring a safe traffic design. The working group were on the same page and getting close to agreeing design options. That is till the business representatives decided to approach the Council directly because of concerns that the parking changes for the design options would in fact impact on their businesses. After escalating this to a couple of the Councillors, our mayor was brought into the conversation. Justin Lester decided to pull the plug on the project (and effectively the working group) and instead go with a very watered-down design that would have painted cycle lanes at the south end of Thorndon Quay. He had a concern that the design options would not get the backing from the majority of his Councillors. (It is understood that he never talked to his team to get confirmation of this). He was concerned that this could turn into another Island Bay situation. (Understandable, but this project was following a much better community engagement approach, and the working group had made good progress). He felt that the Council was making great progress with the other cycling improvement projects, and did not want to put all of this at risk. (A fair statement). The key messages that we left him with is that his decision does nothing to address the risk of vulnerable road users on this dangerous route, but also that his action undermined the trust in the engagement process. The Council has recently published the revised proposed design for Thorndon Quay for public consultation. The design only deals with the section of road between Davis and Mulgrave Street. A key aspect is that it changes the angle parking to parallel parking along the Westpac Stadium side of the street. You can see the proposed design and get access to the online feedback form on this WCC transport project page. Meanwhile the cycling representatives who were part of the working group have set up a “Fix Thorndon Quay” Facebook page to encourage people to have their say. But also to highlight that this revised design proposal does nothing to address the risk to vulnerable road users along the busiest and most dangerous part of Thorndon Quay, between Davis Street and Tinakori Road. With the darker and wetter winter months, the danger from cars pulling into or reversing out of the parking is unacceptably high. The angle parking forces cyclist on to the main road in the path of cars, trucks and buses; particularly with a number of cars now too long for the parking space. There is a real risk of a cyclist being seriously hurt or killed. But also for walkers this part of Thorndon Quay poses a significant challenge and risk, with the lack of pedestrian crossings. Often we see people dashing between angle parked cars, cyclists and traffic on the road. Again an accident waiting to happen. We have waited for years for the Council to resolve this situation. We don’t want to wait longer. 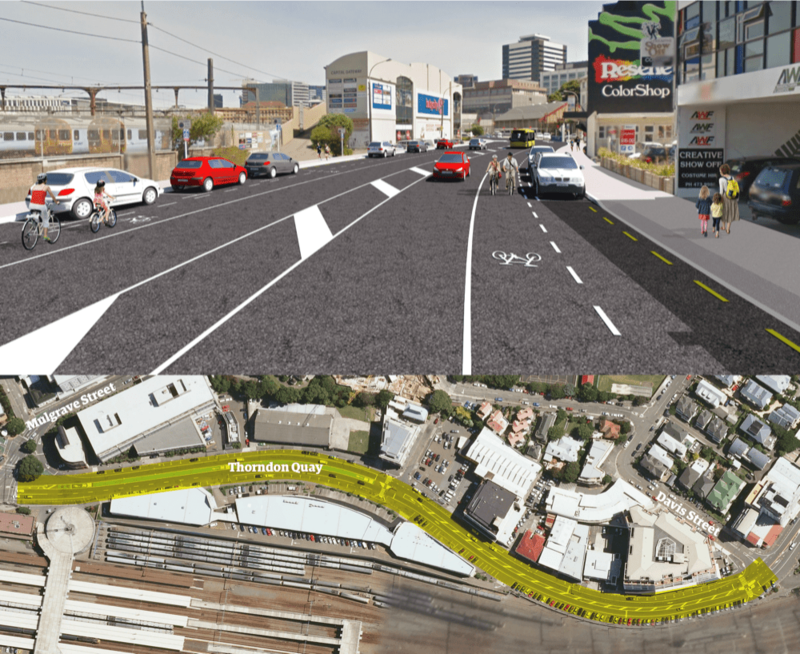 Even if an alternative route via Aotea Quay would become a reality, then Thorndon Quay would still be used by a high number of cyclists and walkers as the most convenient route to get to their work or to get to the local shops. We urge people to submit their feedback to the Council. Tell your own story, how the proposed design may help to address your concerns, and what concerns it does not address. Guidelines on writing your individual submission can be found here. The Council relies on advocacy groups but also individuals to make submissions on design proposals like for cycle ways. Below are some tips on how you can put together an effective submission. Introduce yourself and explain why the particular route or location is important to you personally, e.g. for your daily commute, or getting your kids to school. Give your story that best describes the key concerns are that you experience today, e.g. cars pulling in and out of parking spaces. Explain how the proposed design will help to address your concerns. Detail what concerns it does not address, or what issues the proposed design may create for you. Give your view of what more can be done to make this a great solution not for you right now, but for the future and for others. Below is an example. Don’t copy and paste, but use this to create a submission that is uniquely yours. “My name is Shirley Bessy. I can be classed as a concerned but keen cyclists, and I use Thorndon Quay most workdays as the most direct route to get to or from my work on The Terrace, and sometimes to visit one of the shops on Thorndon Quay. Cycling has helped me enormously with my fitness. Thorndon Quay is the most dangerous part of the route. I have had a few too many close calls where cars pull in and out of car parks, and each day I am really worried that someone will suddenly reverse out of one of the angle car parks and force me into the path of other traffic. I am sure that if I have an accident or too many more close calls that I will stop cycling for my commute. The proposed Thorndon Quay changes will go a little towards making it safer. It will avoid the illegal angle parking along the clearway that currently continues to happen between the VTNZ building and the lights by Mulgrave streets. The road side painted cycle lane will however probably do little to make my commute in the event any safer as drivers will no doubt still pull in and out of car parks without looking for cyclists. The proposal sadly does nothing to make the main part of Thorndon Quay any safer and I am really disappointed that I have to continue to risk my safety on the evening commute back home, particularly during the darker and wetter winter days when I’ve come closest to having an accident and feel really worried. It does not need to be perfect. The important thing is that you have your say! Go By Bike Day: A successful, well run event, though numbers seemed a bit down, perhaps due to the public holiday, and lack of publicity through banners etc. But thanks to WCC for taking on this annual event. CAW needs to think about how to get more members signed up – topic for future meeting. CAN Survey: Jill reminded us that Cycling Action Network is launching a major road safety campaign, the first stage of which is a survey of cyclists views. Take a few minutes to respond, if you haven’t already. Love Cycling Awards: nominations close 13 March: quite a few nominations, but Jill would like more. Event will be 27 March at Bicycle Junction, tickets a mere $10. As well as support from Bicycle Junction, Garage Project and WCC are sponsoring. EBikes in open spaces: Joel de Boer from WCC talked to us about the trial of allowing eBikes on selected tracks. Joel is preparing a report for Council, and welcomes feedback. People were generally relaxed about eBikes on appropriate tracks, feeling that they should in general be treated as ordinary bikes. Lessons from the Wisconsin Bike Fed: Michelle is visiting NZ and talked about initiatives undertaken by the Wisconsin Bike Fed. They have good relations with police, who are active in enforcing laws relating to cyclists, including a mandatory 3 foot passing rule. They visit workplaces and do presentations on green lifestyles, including biking. We discussed getting Wellington Police more involved in cycling safety. Zero Carbon Act. Ellie spoke about this campaign to make zero carbon emissions a legal requirement. There’ll be a ride from Pomare to Parliament on 1 March. WCC infrastructure initiatives: Ron met with WCC. The modifications to the Island Bay Cycleway are expected around May. Council is hearing submissions on the Kilbirnie connections in local groups: James and Eleanor are going. The Hutt Road shared path is expected to be largely complete by March, and there are plans to extend the shared path to the northern end of Thorndon Quay. Bits and Bobs: Peter suggested that Strava could be used to get more insightful bike statistics. Jill talked about how horrible the John St intersection is, but we’ll probably have to wait for the Berhampore cycleway project to resolve this. Peter (the other one) agreed with residents who oppose shared paths.